Race day was perfect on so many levels: The weather; an awesome night’s sleep the night before; the scenery… I mean really - is it even possible to start a race with the Arc de Triomphe as a backdrop and not be in awe?! I made my way to the start with three fellow South Africans and true to character (or maybe just used to the 6 a.m. race starts back home? ), we were some of the first ones to arrive. I was in a complete daze – I was actually there and it was actually happening!! After finding my starting pen and a few minutes of just taking in the moment, it was 08:45 and almost time to start. Like the complete nerd that I am, I got a lump in my throat as the announcer proclaimed: “Go and take Paris – today it is yours!” and with that, we were off. Nearly 35 000 of us. The first few minutes were a bumpy, hop-scotchy affair with a lot of elbowing and hopping over discarded sweaters, plastic bags and water bottles. We settled into a pace soon enough, though, and then it was time to just live the dream. 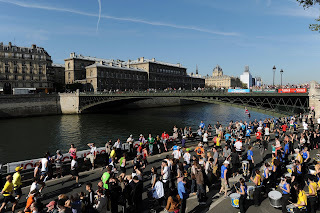 The first few miles just flew by, with bands placed and playing at regular intervals and all Paris’ amazing attractions making one forget about the race completely. I kept reminding myself to slow down (yip, “they” were not lying when “they” said it was easy to get caught up in the excitement of the start and roar off at breakneck speed); and of my “one bite at a time” theory. I was taking it 5 km for 5 km, i.e. from water table to water table, and all too soon the first bite was chewed up and behind me. I must admit, the first water table was quite a culture shock… I quickly realised that politely stepping aside and trying to avoid bumps and shoves were not going to get me anywhere. If I wanted to stay hydrated and well fuelled, I was going to have to jump (and bump) in there and grab what was mine. Which I did from the second refreshment station: With the butchest look I could muster, interrupted by bursts of uncontrollable giggling, I bumped and shoved my way to heavenly slices of orange and handfuls of raisins. Sweet. After mastering the bump-and-grab technique, I hydrated and re-fuelled at every refreshment station and kept reminding myself that the race was actually only going to start at Kilometre 30. The first 30 just had to get done with in order for the real race to start. Which it did. I am extremely thankful to say that there was no wall there for me (this time, anyway), but after 32 km it certainly started to get a bit (okay, sometimes a lot) uncomfortable. Those last ten kays are super far. Man. It’s a good thing that I saw an example of the finisher’s medal at the race expo before the race (yes, I’m a complete medal goof) - I kept reminding myself that I was not leaving Paris without one. Not a chance. I took quite a few walk breaks between kilometres 32 and 40 (they really hurt) and then, like a horse smelling its stable, I roared off and finished the damn thing. Can you believe it?! I did it! I finished my first marathon within the official cut-off, got my medal and finisher’s t-shirt and feel like a million bucks! (The whole marathon experience is one I highly recommend, by the way.) Thanks, from the bottom of my heart, for all the good wishes, thumb holding and support. That is what made this journey one to remember. Great job! 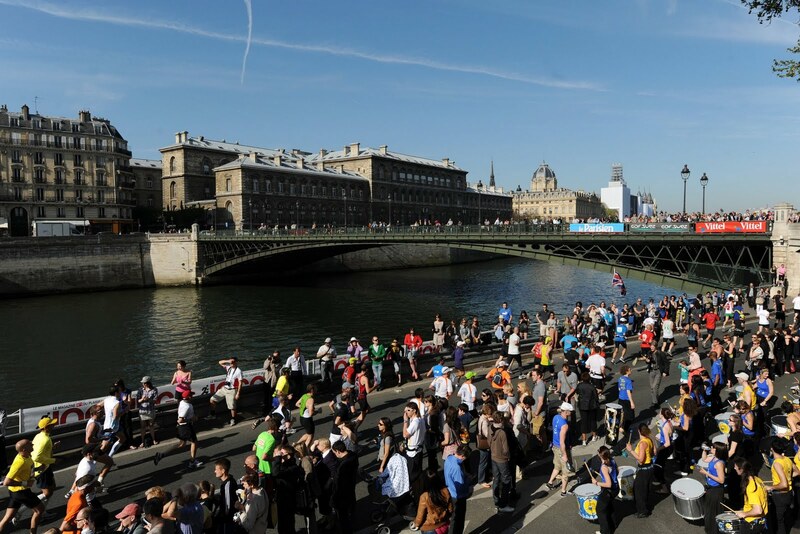 What a perfect city to complete a marathon in. And I love the shirt and medal. Great job! Great report, congratulations! 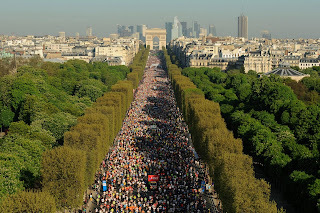 I see there is a Paris Half Marathon in March...I think I'm going to add it to my bucket list. My compliments for your very nice report. 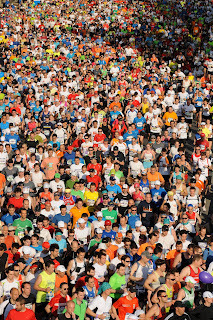 I was there with you and, even for me, it was my first (and probably last...) Marathon: it was a beautiful day among two long wings of extraordinary people. A thanks to all the "parisienne". Thanks so much, guys - I really appreciate it! 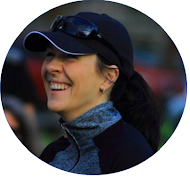 @Andrea: Congrats on your first marathon! Feels great, doesn't it ;-) ? At the starting I was going to cry at the idea of finishing it, but after 4 hours and 26 minutes I got it and it was incredible for me. Translating a famous historical sentence of Neil Armstrong: "It was a small step for a runner but a big jump for me...". 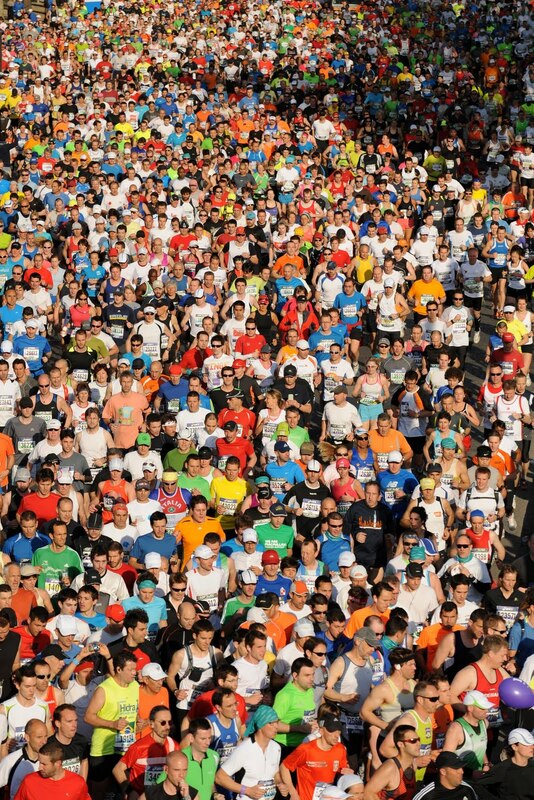 Beautiful landscape, beautiful supporters and beautiful runners from all over the world for an extraordinary Sunday. Fantastic! Well done on finishing the Paris Marathon, you rocked it! Thanks so much! It WAS unforgettable - you'll LOVE it!